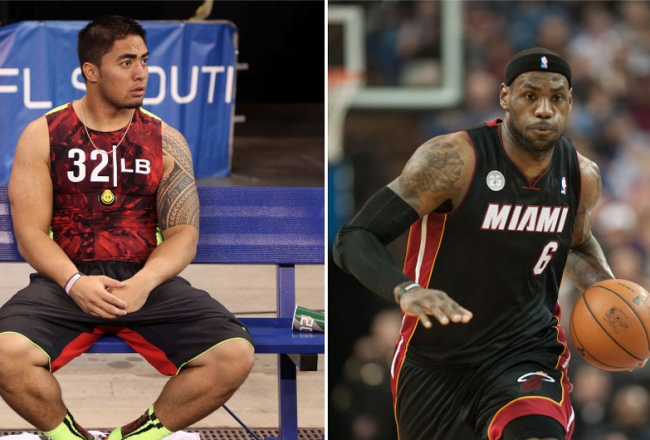 I don't even know what to make of this Bleacher Report story about LeBron saying he ran a 4.60 40--and pointing out that he is faster than famed Golden Domer and fake dead girlfriend rumor maintainer Manti T'eo. I guess (a) yeah, I could have guessed he is faster than that in a 40. I bet he can run faster than that dribbling a basketball or two. And (b) if he had a fake girlfriend, she'd be much much hotter. And named something like Dwayna Wadebosh. Or something like that.